Race 2 in the second round of the NASCAR Playoffs is the 1000Bulbs.com 500 from Talladega Superspeedway. It’s also the race that can have a dramatic impact on the Playoff standings. Get caught up in one of the accidents and your Playoff life could be in danger. Avoid trouble and finish near the front and you could book your ticket to the Round of 8. Four more drivers will be eliminated from the playoffs next week at Kansas Speedway. What happens today will set the scene for the Hollywood Casino 400. Of the 12 cars in this round of the Playoffs, 7 are Fords. Stewart-Haas Racing owns 4 of them. In a show of restrictor plate dominance, Stewart-Haas cars own the first 4 positions on the starting lineup after qualifying. 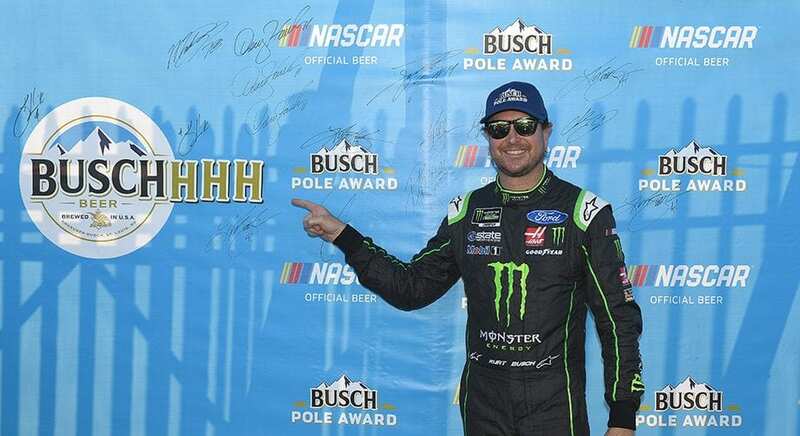 Kurt Busch(41) won the pole, Clint Bowyer(14) starts next to him on the front row. They are backed up on row 2 by teammates Kevin Harvick(4) and Aric Almirola(10). The other 3 Blue Oval representatives belong to Team Penske. Brad Keselowski(2), Ryan Blaney(12), and Joey Logano(22). They also qualified as a group and will start 18th, 19th, and 20th. it will be interesting to see how the teams fare as they work together to hold position or move to the front. Drafting with a friend is a huge advantage on the 2.66-mile superspeedway. The Stewart-Haas teammates lined up and led the pack from the start of the race. Jeffrey Earnhardt(96) spun through the front stretch tri-oval bringing out the caution on Lap 10. Everyone pitted during the caution for fuel, the only lap that Kurt Busch did not lead of the 55 laps in Stage 1. Six Fords in the first 6 positions. It could have been 7 but Keselowski had to pit for a loose wheel late in the stage. An alarming development considering he had not changed tires to that point. All teams retorque lug nuts prior to the start of the race, how did one come loose? During the stage ending caution, Keselowski’s team took the extra time to check the wheel studs, lug nuts and spacers. Hoping to avoid a repeat of the loose wheel incident. For the first time all day a Stewart-Haas car did not lead a green flag lap. Ryan Blaney, first out of the pits led the pack into Turn 1. 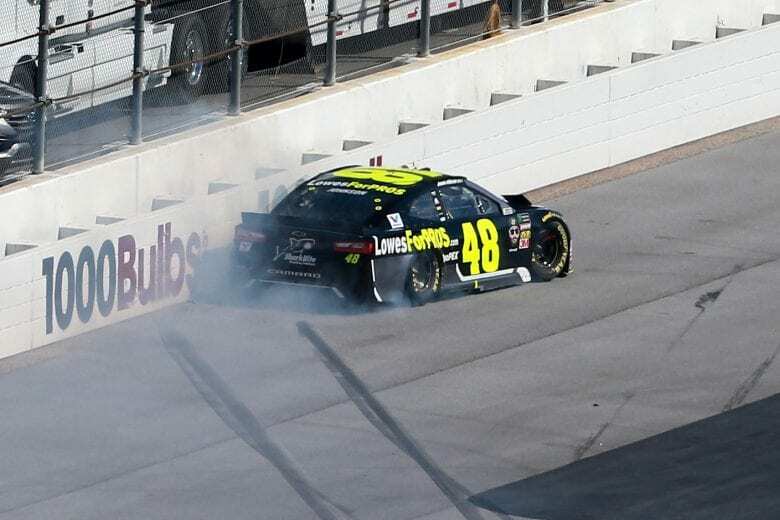 On Lap 61, Jimmie Johnson’s(48) string of bad luck continued as he spun in the tri-oval and hit the wall past the exit of pit road. The accident damaged the left front of the #48 machine and cost them a lap while making repairs on pit road. It was announced, earlier in the week by Hendrick Motorsports, that Chad Knaus would not continue as the crew chief for Johnson. The pair that combined for 81 wins and 7 championships over 17 years will be separated at the end of the 2018 season. The caution allowed Keselowski to rejoin the lead lap, courtesy of the lucky dog rule. On the restart, the 4 Stewart-Haas cars realigned at the front of the pack. This time Bowyer led, then Harvick moved to the front. While Almirola and Kurt Busch followed. They fought off a brief challenge from Joe Gibbs Racing (JGR). As 3 of their drivers Kyle Busch(18), Daniel Suarez(19), and Denny Hamlin(11) ran the top line next to the leaders. Team racing works at Talladega if you can keep all members of the team focused on working together. The JGR group fell apart as cars jockeyed for position. Single file racing was the order of the day during the first 2 Stages. 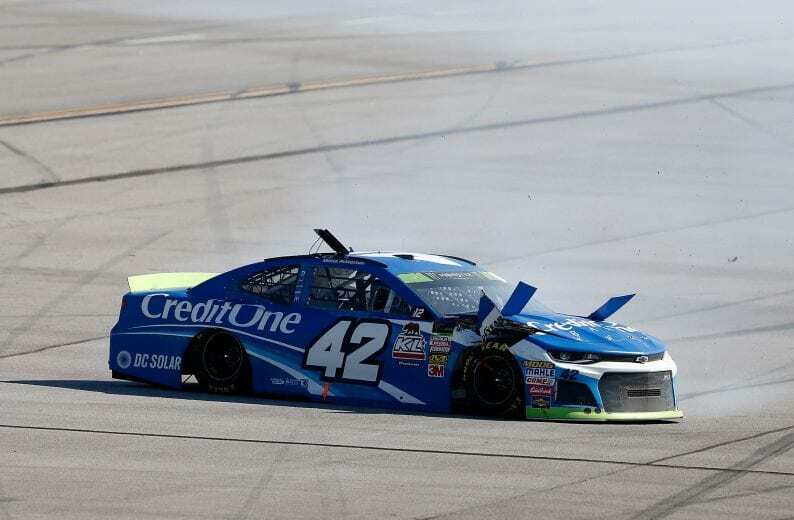 Kyle Larson spun around when a tire failed going down the backstretch 7 laps from the end of Stage 2. The caution presented a dilemma for crew chiefs. Stay out and earn points or pit now and gain track position for the final stage. With Almirola and Bowyer starting the race below the Playoff cut-line, Team Stewart-Haas stayed on the track. As did the remainder of the top 11 in the lead group. Again Stewart-Haas Racing took the top 4 positions at the end of Stage 2. They have run 1-2-3-4 for all but 2 laps of green flag racing during the first 2 Stages of the race. The first 2 Stages consisted of 55 laps each, 78 laps make up the final stage of the 1000Bulbs.com 500. Caution flag pitstops avoided the need to visit pit road under green. The Final Stage may necessitate a green flag stop, will team tactics hold or fall apart if that happens? With the late caution in Stage 2, those who pitted during the Larson caution stayed out during the stage ending pit stops. Keselowski and William Byron(24) led the pack to the green flag restart. Harvick, in 12th, was the highest position held by a Stewart-Haas driver. Racing at the front of the pack got serious quickly in the Final Stage. Cars going 3 and 4 wide became the norm as everyone sensed it was now important to be out front. There had not been a multi-car accident to this point in the race. But, “big one” was lurking. As Keselowski and Byron swapped the lead at the front of the pack the driver’s behind swapped lines to improve their position. With 57 laps to go Kurt Busch and Harvick were running in 2nd and 3rd behind Keselowski. Back in 7th and 8th, Almirola and Bowyer were a part of the lead group as the bottom line began to assert itself again. 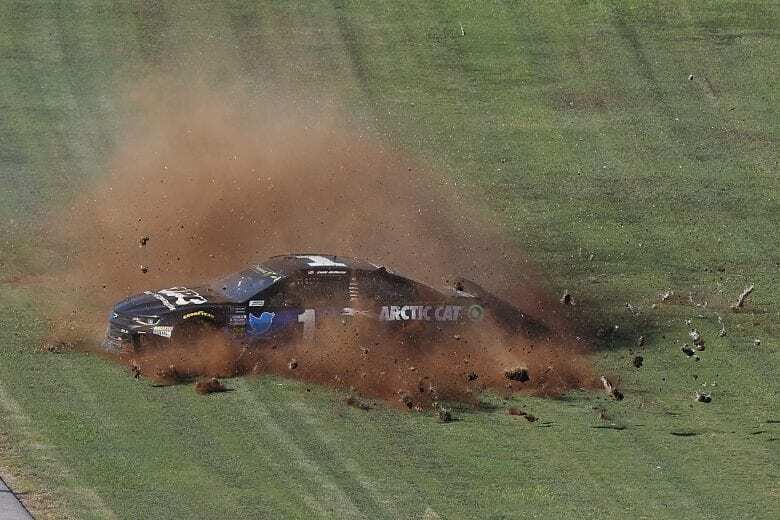 Jamie McMurray(1) spun in the tri-oval on Lap 135, ending up stuck in the grass separating pit road from the race track. The caution allowed teams to pit for fuel and fresh tires. Another pit-stop will be required for fuel to finish the 188 laps scheduled. Kurt Busch, Harvick, and Bowyer all line up on the inside row 1st, 3rd, and 5th. Penske Teammates Keselowski and Blaney sit 2nd and 4th on the outside line. Almirola and Logano are out of place. But, when the green flag drops for the restart, the Stewart-Haas cars line up as do the Team Penske drivers. It only takes a couple of laps for Kurt Busch to pull the top 10 cars into a single line break-away. 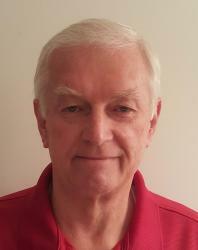 Fuel economy is a concern for everyone. Kyle Busch(18) and Martin Truex Jr.(78) pitted 2 laps after the leaders and dropped to the rear of the field on the restart. Hoping to conserve fuel and avoid the accident everyone expects. D.J. Kennington(7), running in 35th position 3 laps down, came to pit road as the leaders completed Lap 160. A loose tire off his car rolled across pit road and into the grass on the tri-oval. NASCAR waved the caution flag and again pit strategy came into play. The leaders stayed out, thankful for the opportunity to save gas. The back half of the field pitted to be safe and get fresh Goodyear rubber. Will the lead alliance hold together on the restart? Yes they do, 1-2-3-4 on the bottom line. Last weeks winner Chase Elliott(9) lead the outside line but quickly dropped away from the leaders. With 10 laps to go, drivers began to make moves. Behind Almirola in 4th, the pack split 2 and 3 wide. The top 4 pulled out quickly to a 20 car length lead. As the rest of the field jockeyed for positions, the wreck everyone was waiting for happened. Not the “big one” only a few cars were involved. Still, it bunches the field up for what turns into an overtime green-white-checkered finish. Coming to the green flag Harvick’s car began to sputter, he pulled onto pit road for fuel. Kurt Busch, Bowyer, and Almirola drove on to lead the restart. Almirola drove up behind Busch as they took the white flag. An accident in Turns 1 & 2 threatened to end it. But, NASCAR held the yellow flag as those involved slid down the track to safety. Coming out of Turn 4, Ricky Stenhouse Jr.(17) had moved into 3rd and had a run on the leaders. Almirola pulled up in front of Stenhouse Jr. just as Kurt Busch ran out of fuel. The push from Stenhouse Jr. rocketed Almirola into the lead and blunted the momentum of the #17. Bowyer passed and followed Almirola across the finish line. Almirola ran in the 4th position most of the day. “Being the good team player,” he stated. Ultimately it proved to be a big factor that contributed to Almirola’s victory. Aric said, “I was able to run at 1/2 and 3/4 throttle over the final portion of the race conserving fuel.” Then, when it was time to go he had the Sunoco Gasoline he needed to run full power to the finish. NASCAR delayed the final restart an extra lap allowing broadcast partner NBC to get in their required number of commercials. That extra lap likely cost Kurt Busch the win. In addition, Busch questioned NASCAR’s decision to not throw the caution for the last lap accident. Had they done so, he could have coasted across the finish line with the victory. In NASCAR’s defense, with attendance falling television is paying the bills. Giving NBC the nod to meet their requirements is good business. The fans hate yellow flag finishes. So, if those involved in the wreck were not in a critical situation ending under the green was also a well-calculated decision. With exciting finishes in the last 3 races, the Monster Energy NASCAR Cup Series Playoffs are getting the exposure that draws fans to races. Almirola and Bowyer started the day below the cut line for the Round of 8. Their 1-2 finish put Almirola in and Bowyer 21 points up on from the cut line. Truex Jr. and Keselowski fared the worst. Truex Jr. is on the bubble, just 18 points above the cut. Keselowski is currently 9th and 18 points out of the Playoffs with 1 race to go in this round. It’s likely the bottom four will need a win to advance unless Bowyer or Truex Jr. suffer an accident or major component failure at Kansas. Currently, 5 Fords are in a position to move to the next round. Keselowski and Blaney will need help to get there. Previous article2019: Home Buyers Market Ahead!